Instead of struggling to complete your Christmas shopping in a crowded mall, consider giving your friends and family homemade Christmas gifts. These gifts make thoughtful presents for everyone on your list. Crafty gifts provide a unique alternative to store- bought merchandise. 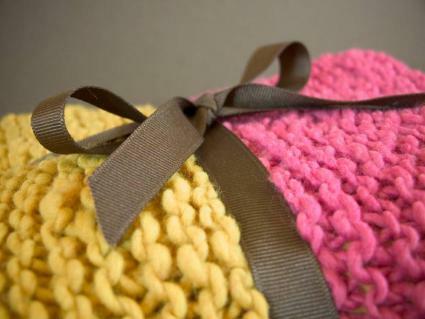 In fact, presenting someone with a one-of-a-kind handmade present is a fabulous way to show how much you care. What type of gift should you make? The answer to that question depends on your previous crafting experience, your budget, and the amount of time you wish to spend on the project. Some crafty homemade Christmas gifts are simple and inexpensive, while others require more money and a substantial time commitment. Choose the craft that suits your skill level and interest. Personalized Christmas stockings: Include some themes or items that are personal to the recipient. No-sew fleece blanket: Choose fabric in the recipient's favorite color or with a design that reflects a hobby or special interest. No-sew scarf: Scarves are pretty and practical gifts. Homemade candles: Use peppermint, sugar cookie or other seasonal scents to make them holiday special. Bath salts: Make this gift festive with a Christmas scent and a pretty container. 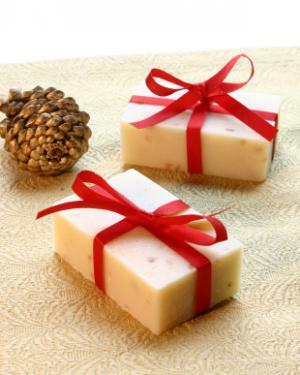 Handmade soap: Soap in seasonal shapes such as snowflakes or snowmen is sure to be a hit. Gel candle: Gel candles made in unusual containers with Christmas-themed embeds make for beautiful Christmas gifts. Package of blank handmade note cards: Tie a stack of cards with a ribbon bow and add a pretty pen for a simple gift. Scrapbook of family photos: A personalized scrapbook is sure to be cherished for generations to come. Personalized calendar: A calendar with birthdays, anniversaries, and other important dates already marked is sure to be appreciated by a forgetful relative. Christmas tree ornament: Handmade Christmas tree ornaments make great gifts for neighbors, teachers, and other special people in your life. CD of holiday music: Burn a CD of your favorite public domain Christmas music and add a customized label for simple yet inexpensive Christmas gift. If you have small children, there are many Christmas crafts for kids that make excellent presents for grandparents, aunts, uncles, teachers and daycare providers. Since everyone needs to eat, food gifts are an excellent choice for homemade Christmas gifts. You don't need to be a gourmet chef to make most food gifts, but they do require some advance planning. Sugar cookies: Sugar cookies are a guaranteed crowd pleaser. Cut them into shapes like trees of snowmen before decorating. 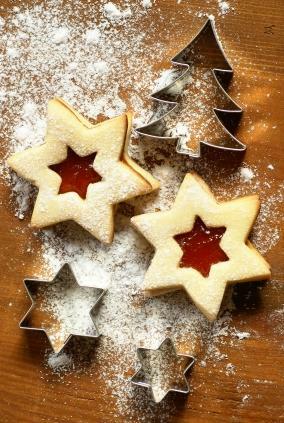 Windowpane cookies: Hang these from ribbons and they can double as tree ornaments. Peppermint candy cookies: Use different colors and flavors of candy mints to personalize these cookies. No matter what recipe you choose, remember to make a few extra batches for yourself. You'll get to enjoy the result of your hard work and practice up on the latest cookie decorating techniques. Gingerbread houses: Add some details that are reminiscent of the house your recipient lives in. Hot cocoa mix in a jar: Add some tags and decorations to the jar for fun gift. What do you do for homemade Christmas gifts if you're not crafty and you hate to cook? Give the special people on your Christmas list the gift of your time. Do you love taking care of children? Most new parents will jump at the offer of a night of free babysitting. Are you good with cars? Give someone the gift of a free oil change. Do you love to shop? Offer to go grocery shopping and run errands for an elderly relative. Are you famous for your housekeeping and organizational skills? Give an admitted slob the gift of a neat and tidy house. If you're worried about the presentation of your gift, use your computer to create a gift certificate or coupon book announcing your intentions. For extra pizzazz, decorate your masterpiece with a few Christmas clip art images. Short on Dough: Tie a ribbon around a package of cookie dough or cookie dough mix, then add a note that says "I hope this comes in handy since everyone's a little short on dough this Christmas." Gift Not Included: Wrap up a small package of batteries in a box with a pretty ribbon, and then add a tag that says "Gift not included." From One Nut: Add a tag to a can of mixed nuts that says "From one nut to another." Melted Snowman: Fill a small glass jar with water, black buttons, and a carrot. Add a label that says "Melted Snowman." 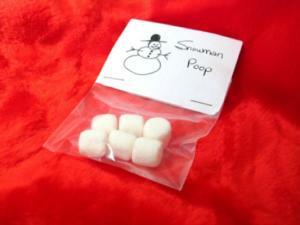 Snowman Poop: Add a clip art image of a snowman and a tag that says "Snowman Poop" to a bag of mini marshmallows for a gift that's sure to be a hit with young children. No matter what type of homemade gifts you give this year, be sure to make them with love to let those you are giving them to know that you care. They'll be sure to appreciate whatever you give them, as long as they know it's from your heart.